I love David Bowie. That isn’t exactly shocking. A lot of people do; it isn’t a solitary love. As for many people my age, it all started with a journey through Labyrinth. I’ve been lucky enough to see him in concert twice (once as part of Moby’s Area2 Festival in 2002 and once for the Reality tour in 2004). His music has been an underlying soundtrack. 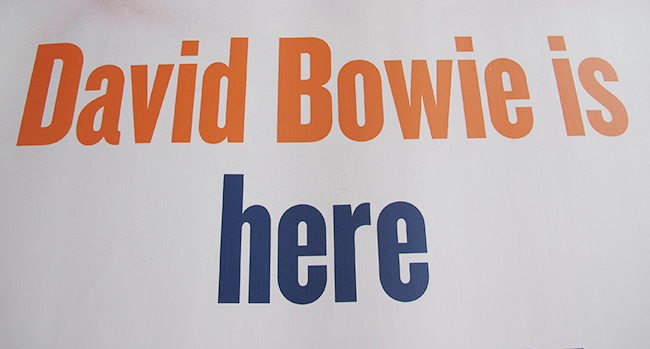 The exhibition David Bowie Is originally opened at the Victoria and Albert Museum in London, England. I had flights of fancy about making a pilgrimage to see the show but instead crossed my fingers it would tour somewhere in North America. Low and behold, it did! And I didn’t even have to travel – its world tour premiered right here in Toronto at the AGO on September 25th. It features costumes, art, film, sound, and ephemera from David Bowie’s entire music career in a non-linear format. We got the chance to visit last week and it didn’t disappoint. There were so many different little nooks and rooms. Some of my favorite highlights was seeing his handwritten song lyrics and the costumes (and shoes) from stage performances. Kansai Yamamoto’s glittery great creations for the Aladdin Sane tour, the tattered Alexander McQueen Union Flag coat, his sketches as a teen…seeing these things in person was breath-taking for me. The accompanying audio shifts as you move through the exhibit; part of my joy was seeing people start to dip their heads to the beat in their headphones in unison. Near the end there was large projections of amazing live performances that gave me goosebumps. Book your visit in advance; it is at the AGO until November 27th!